Wait! Do You Want to Save $40? 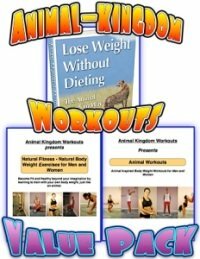 If you purchse the animal-Kingdom-workouts value pack you'll get "Natural Fitness - Natural Bodyweight Exercises for Men AND Women" (a $29.95 value), "Animal Workouts - Animal Inspired Bodyweight Workouts for Men AND Women" (a $24.95 value) and "Lose Weight WITHOUT Dieting - The Animal Kingdom Way" (a $29.95 Value) for only $44.95. This also includes all of the bonus items that come with the above products including "Nerve Force" by Paul Von Boeckmann, "Fitness and Health E-Book", "My Breathing System" by J.P. Muller, "Weight Loss Tips and Advice" as well as lifetime updates for the animal and natural exercise ebooks. That means you're getting over $300 worth of value for only $44.95. Option A - Count Me IN! I'm serious about getting in fantastic shape NOW! Plus I realize that exercise and diet go hand in hand! Rather than just get "Lose Weight Without Dieting" for $29.95 I'd rather get the whole enchilada for $44.95 now and save some money! Option B - Sounds like a great deal but I'm going to pass. The "Lose Weight WITHOUT Dieting" Book for $29.95 is all I want at the moment. Thanks anyway! NOTE: Whichever option you choose for your security you will be taken to a secure order form at ClickBank.com. The order form will look something like this when you click on either "Order Now" button.